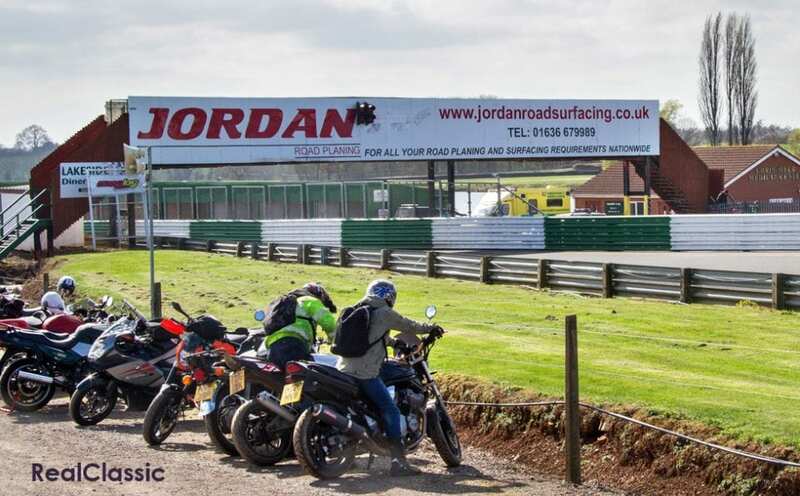 You can tell when spring has arrived because the daffodils are in bloom, there’s blossom on the trees and the VMCC’s British Historic Racing section have their practice day at Mallory Park. 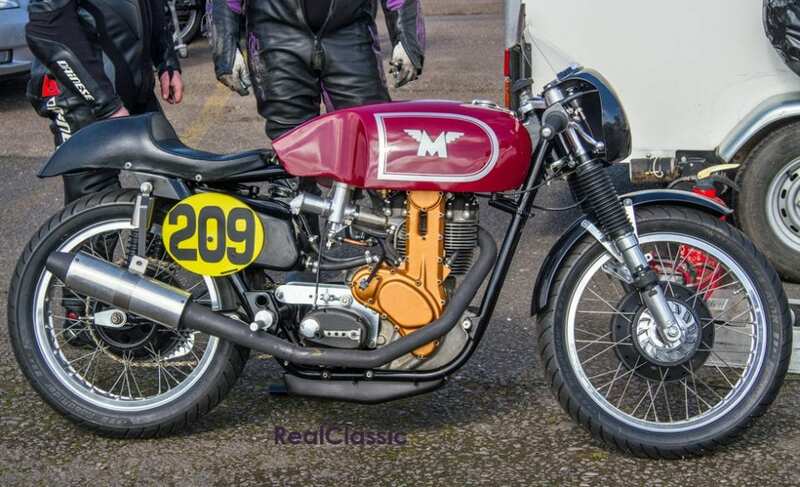 With this in mind, Richard Jones loaded Tessie the Hinckley Triumph with camera, cigarettes and Mrs Jones’ excellent cheese and onion sandwiches for a trip up to the hinterlands of Leicestershire – as you can see the weather was glorious. First thing to do is to have a trip around the paddock where it is very informal and you can have a chat with those taking part, possibly because the stress levels are lower than on an actual race day. 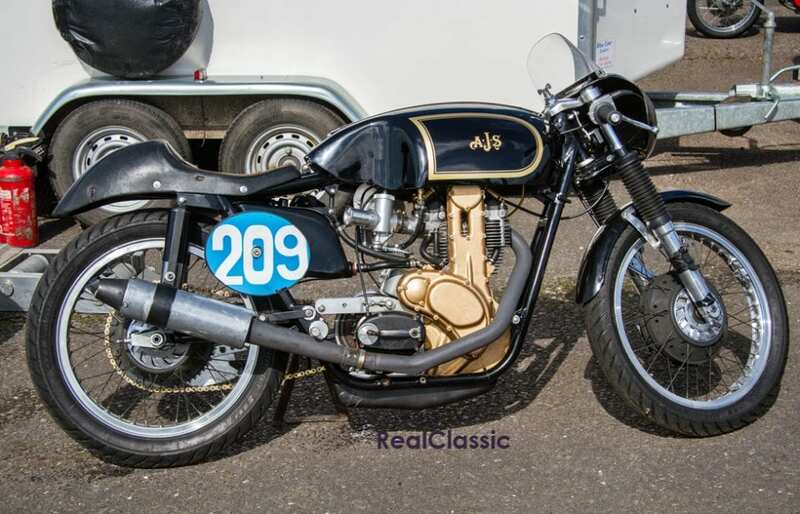 If you were a Velocette fan then you would have been pleased to see so many examples of the marque on display including this one which, as you may notice, has a Norton featherbed frame. 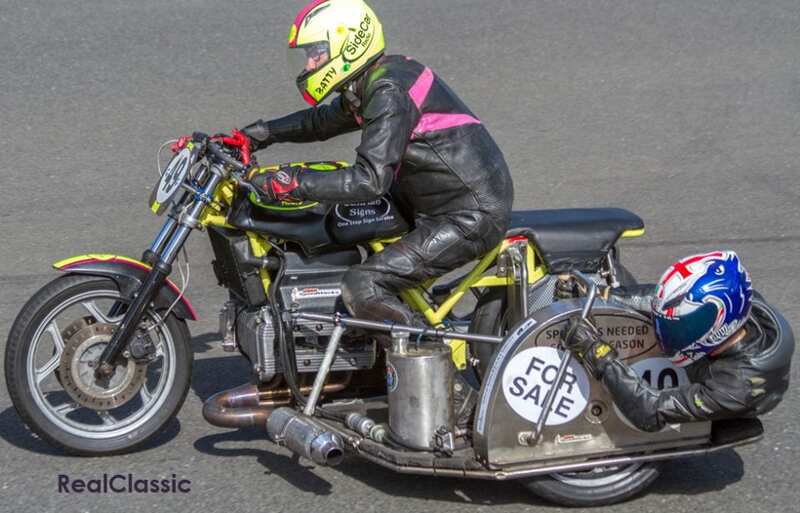 It wasn’t being taken out on the track and was just down to be registered but the owner told me about two Velos he owned, one of which has been bored out to 675cc and lives in a Seeley frame. Certainly one to watch out for when the BHR series starts in earnest. 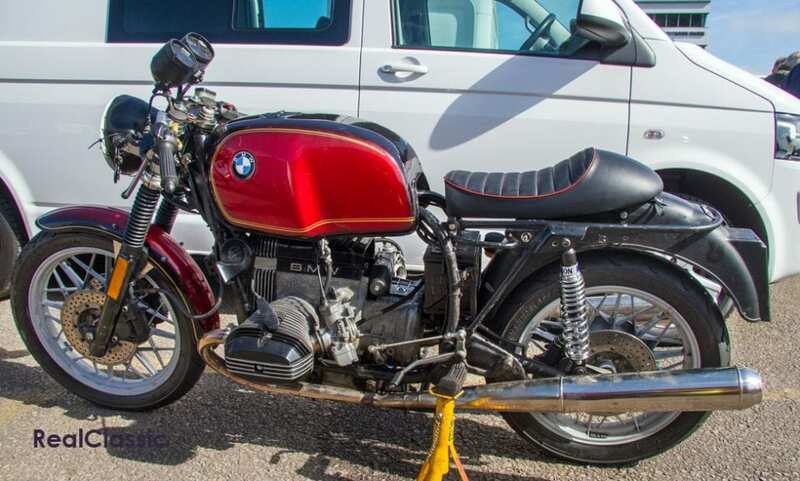 Most of the BMWs at Mallory had three wheels, more of which below, but I found this solo sitting in the sunshine looking rather splendid with its red smoke paint in pristine condition: something of an accomplishment considering it’s a racing machine. 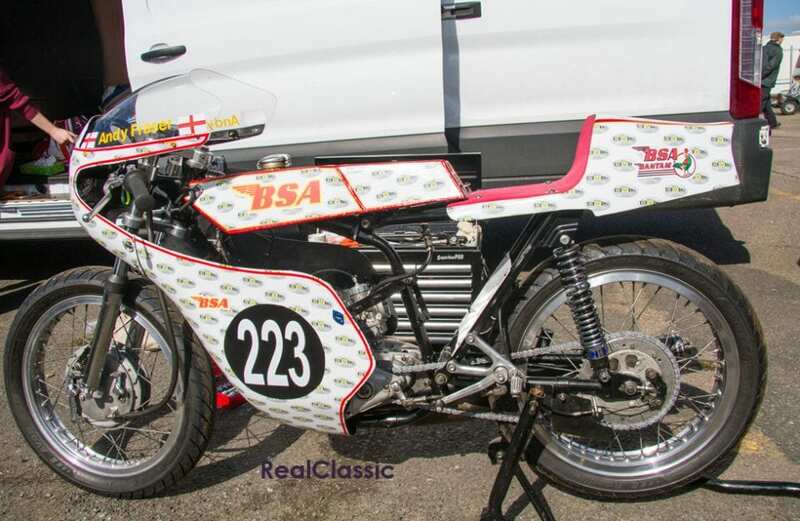 Another interesting bodywork design, this time on a BSA Bantam, which certainly stood out in the paddock. 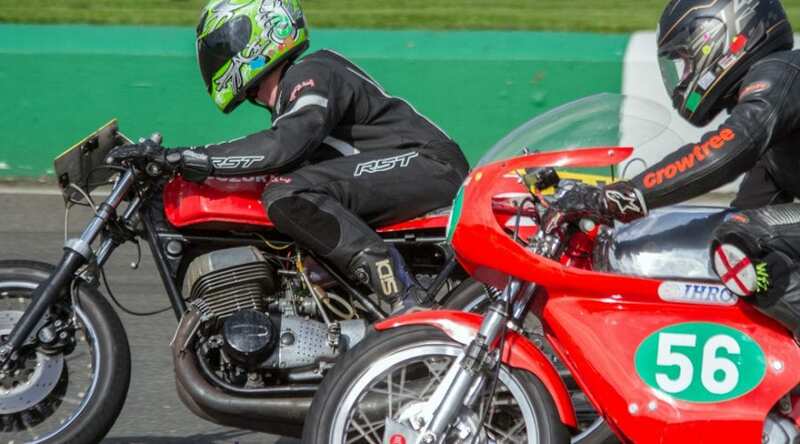 The stickers on the fairing suggest its rider is Andy Fraser. My reports always feature at least one machine which is red and Italian. 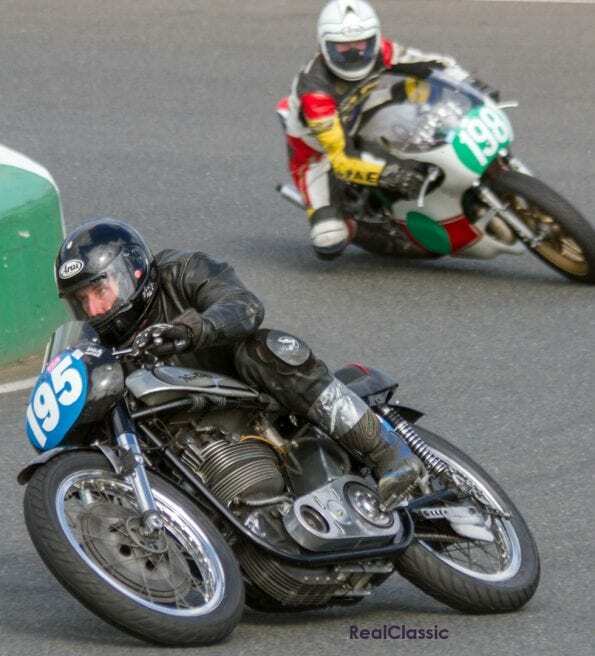 There were a few Ducatis on the track. As always, they manage to display that inherent Italian panache and flair even when they are standing still. I had to include these two as they were parked up next to each other and were so photogenic that I spent some time trying to get them just right. I hope you think it was worth the effort. 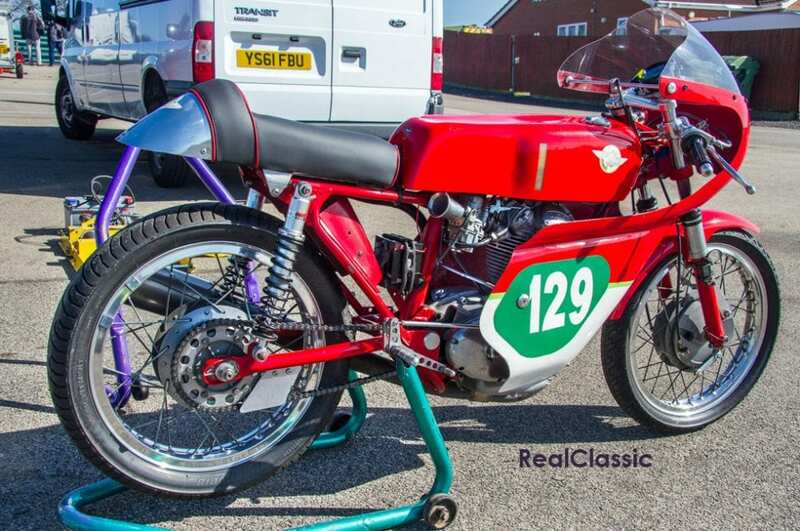 It’s not often that you see one of these being raced. 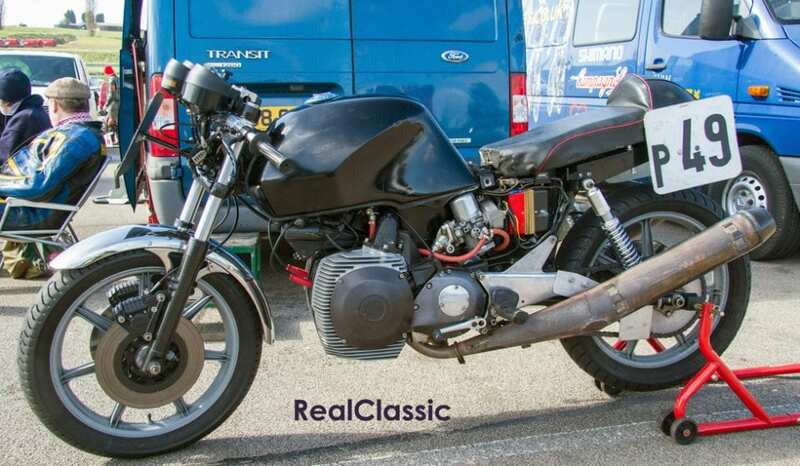 This particular Norton rotary dates from 1983, perhaps making it a P41 engine from a police issue Interpol machine which pre-dates the Classic. That being said, race machines tend to be a collection of parts from here, there and everywhere. The owner / rider was in deep discussion with three other gentlemen about the actual capacity of the engine. I won’t say the discussion was heated but there was much talk of swept volume, when the engine sparked and what the crank was doing. 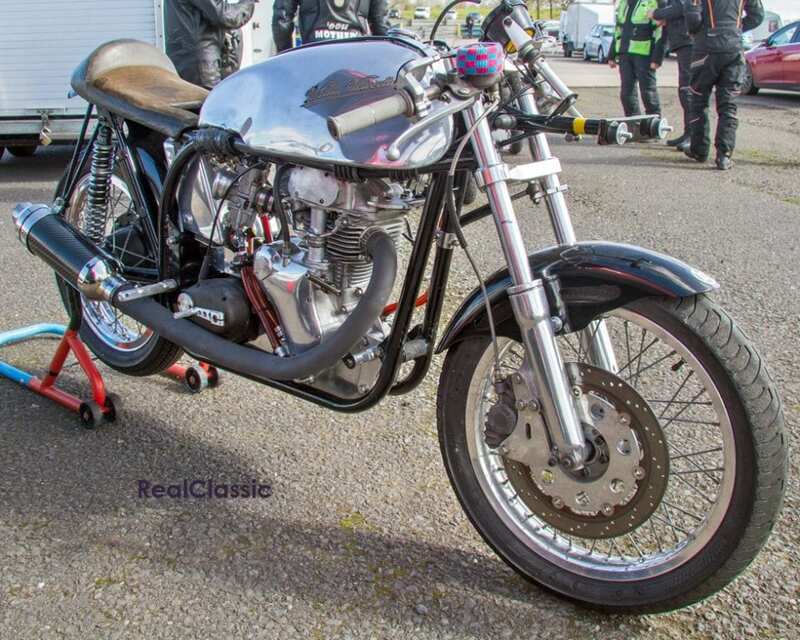 Folk with long memories will recall that exactly the same debate dogged Norton’s water-cooled F1 racers when they first took to the track – 588cc is the accepted measurement. This may have been a practice day but that doesn’t mean that – out on the track – a certain element of competiveness was absent as you can perhaps see from this photograph. What’s the point of practising if you can’t practise overtaking? 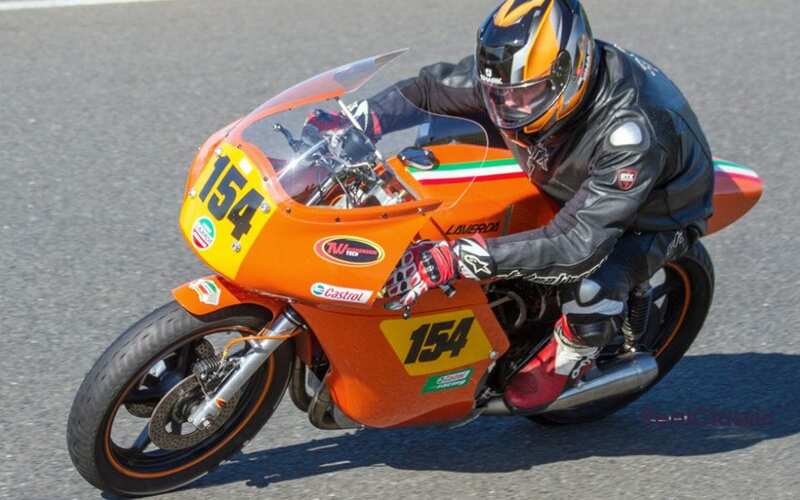 This Laverda looked seriously quick and, being this rather fetching shade of orange, it also makes a rather striking shot. It is Italian but it’s not red so I can’t be accused of favouritism. There were also some more exotic and rare British marques out on the track. 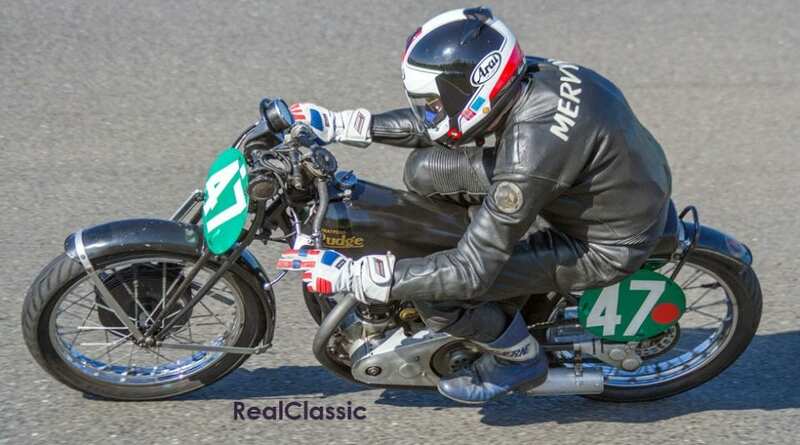 Given the lettering on the back of the leathers I’m assuming this is Mervin Stratford on one of his 250cc, 4-valve Rudges of which there were two present, both bearing the number 46. 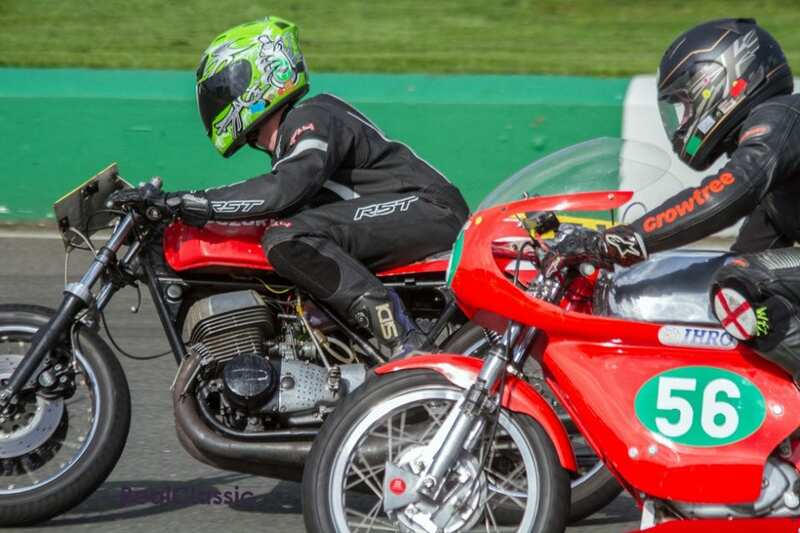 Alternatively someone had borrowed his leathers – whoever it was went too fast for me to be able to ask. To my mind the sidecar and three-wheeler men and women provide the best entertainment and value for money. 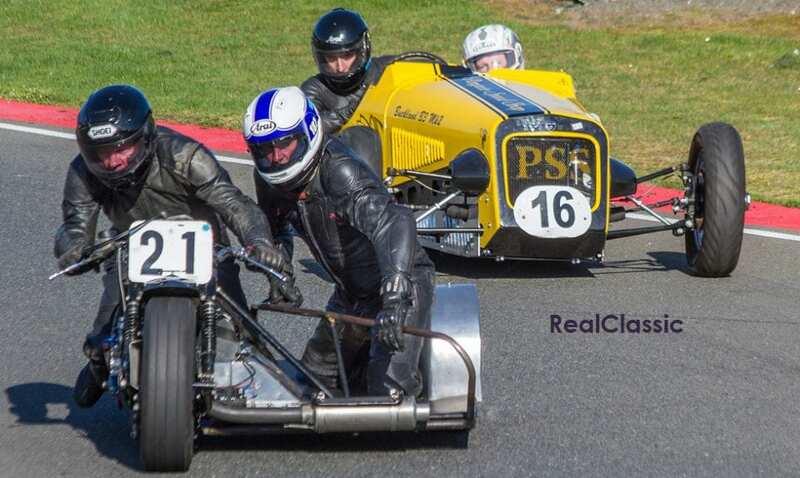 The antics of the sidecar co-pilot (as they do all the hard work the term ‘passenger’ seems derogatory) are always well worth watching. However I have no inclination whatsoever to take part in such a practice despite this particular BMW outfit being so obviously for sale. There seemed to be something of a dogfight going on between this Vincent outfit and the pursuing Buckland B3. I’m not sure if either won, this being a practice, but the Vincent was out front – just – each time I pressed the shutter release. 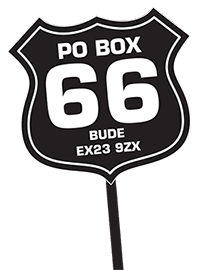 This is surprising as the Buckland comes from the Penguin Speed Shop in North Wales where everything is always better (or perhaps I’m just biased).